Our track records show that a master degree from HHL will provide you with exceptional career opportunities that will make your financial investment well worthwhile. However, we are aware of the fact that pursuing a master program at HHL requires serious commitment and thorough financial planning. To help making your study at HHL possible, we offer different options to finance your tuition fee and living costs. For the best students, to cover living costs in Germany (foreigners have to show financial resources of EUR 735 per month to obtain a student visa), HHL has established several links to private sponsors, companies and governmental organizations. These close relationships will help students to finance the stay in Germany. In addition, we recommend all foreign applicants for one of our programs to contact relevant national agencies in their respective home country. A lot of foreign governments have own scholarship programs to support a stay of their students abroad. The scholarship database of the German Academic Exchange Service (DAAD) should be one of your most important sources for your scholarship application. Please visit the website of the German Academic Exchange Service’s scholarship database, and choose your country of origin. You must apply for most programs online. The German embassies in your home country will assist you. Please make sure to meet the application deadlines. For most programs, the German government will assist you with EUR 750 per month as a Master student or EUR 1,000 per month as a doctoral student. HHL receives EUR 25,000 (for 2018), EUR 15,000 in 2019 and 2020 per year from DAAD to assist the best foreign students to cover their living costs. The minimum installment is EUR 250 (one month); the maximum installment is EUR 850 (Master incl. MBA) or EUR 1,000 (doctoral students) per month for a maximum of 6 months. Scholarship holders are expected to support the international department of HHL for 4 hours per week. Prospective students should apply for the scholarship via regular mail. Current students can submit the application directly to the International Office. The scholarship will be awarded in Fall only, and is co-financed in Spring by the Kolle Foundation with the same amount. All students admitted to HHL as well as enrolled HHL students. Prerequisite for the scholarship payment is an enrollment at HHL. Launched in 2011, the National Scholarship Program supports highly motivated excellent students. With this initiative the German federal government aims at establishing a new culture of giving and supporting education by companies, individuals and foundations. The initial amount of the scholarship is EUR 300 per month. The scholarship is financed by public funds (50 %) and private funds raised by HHL sponsors (50 %). This initial amount can be increased by the private sponsor. The annual number of scholarships to be awarded will be published by the Director of Financial Aid of HHL. In 2018, HHL can support 10 students. The National Scholarship Program started at the beginning of the fall semester 2011 and continues on a semester basis. The scholarship requires a formal application. Application period is June 1-30 for the Fall term (September) and February 1-28 for the Spring term (April). The duration of a scholarship is 12 months. The scholarship is renewable on application. The scholarships are awarded by a selection committee. This committee consists of the Director of Financial Aid and the heads of the academic programs of the applicants. A) Academic performance: HHL applicants must have a minimum GMAT score of 650; currently enrolled HHL students must have achieved a GPA (grade point average) of min. 1.60 in their degree program by the scholarship application deadline. B) Previous special successes, awards and prizes, to be proven by the applicant. C) Non-university or non-professional commitment such as voluntary work, community, social, university or political involvement. D) Special personal or family circumstances such as illness and disability, care of own children, especially as a single parent, or close relatives to care, employment in family business, own current employment, family background or migrant background. Failure to meet the application criterion A) is an exclusion criterion, criteria B) to D) will be considered by the selection committee, provided they are adequately demonstrated by the candidate in German or English. For accompanying documents that are not written in German or English a certified translation must be submitted together with the original version. The applicant will be informed in writing about the scholarship decision. Exclusion criterion for granting a scholarship is performance-based financial support from a domestic or foreign institution in case it exceeds a monthly average of EUR 30 per semester. By the end of the first semester of the funding period HHL reviews the academic results of the scholarship holder for the continuation of the scholarship. The requirements are fulfilled with a GPA of 2.0. Together with the financial award, scholarship holders receive a certificate stating the name of the scholarship, its prerequisites, its amount and duration. The certificate also includes the names and logos of the donors. Scholarship applicants agree that their personal data will be transmitted to the public donors for statistical purposes and for a review of the exclusion criteria. Furthermore, applicants accept that they may be asked by HHL to appear in press and publicity in connection with the scholarship. Scholarship holders have to notify HHL immediately about changes that are relevant to the approval of the scholarship. Any violation of this requirement or in the case of determining a non-prolongation of the scholarship after the first semester will result in a revoke of the scholarship to the end of the calendar month, with a notification of a six week period for repayment of unjustified amounts received. In the case of an unjustified double funding, the scholarship will be revoked retroactively with an immediate repayment period. There is no legal claim to the award of a scholarship as described above. This scholarship complements the DAAD support within Stibet. This need based scholarship covers living costs and/or tuition fees. The total amount of all Karl-Kolle-Scholarships is EUR 15,000 per year. A high GMAT score, excellent academic performance and proof of financial need are awarding prerequisites. The maximum available amount per student is EUR 850/month for graduate students and EUR 1,000/month for doctoral students. Applications for the scholarship must be sent by regular mail. Current students can submit it directly to the International Office. The scholarships will be awarded in Spring only, for Fall the rules of the Stibet scholarship will apply. The Program has an overall indicative financial envelope of EUR 14.774 billion for the seven years (2014-2020). More than 4 million young people, students and adults will gain experience and skills by studying, training or volunteering abroad through Erasmus+. Education, training and non-formal youth learning are keys to creating jobs and improving Europe’s competitiveness. That’s why Erasmus+ will make a key contribution to addressing these challenges. 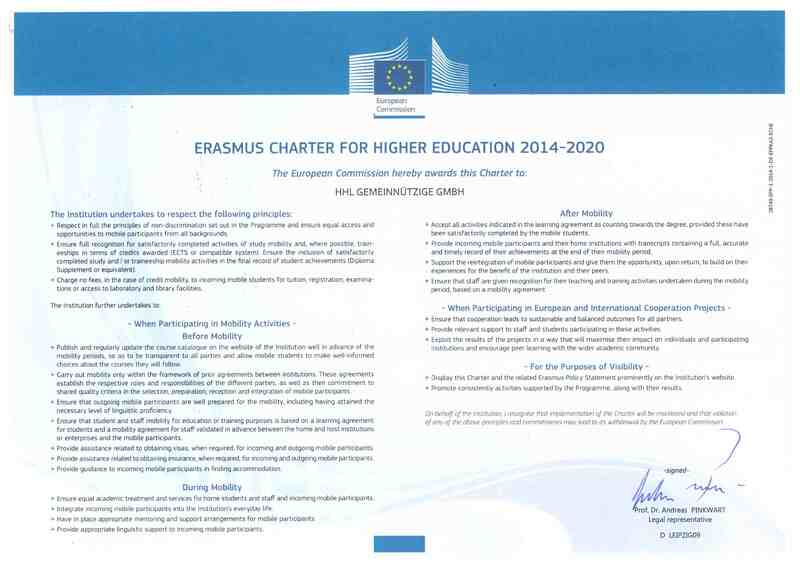 Information about Erasmus+ you may find on the Website of the European Commission. According to the guidelines of the EU, HHL has to publish this ECHE on the Internet (see links below). Sparkasse Leipzig is the financial cooperation partner for students from the EU. They offer low-cost student loans without presenting additional securities. Sparkasse Leipzig is the official financial partner for HHL students. Once admitted to HHL, students can apply for a student loan without presenting additional securities. The flexible loan covers the tuition fees up to EUR 30,000 with the repayment starting 12 months after graduation at the latest. Students from non-European countries can also apply if they can provide a person (from Germany) willing to act as a guarantor. Further student loans are available from various banks and institutions. Depending on financial needs there is the opportunity to apply for federal financial support according to Bundesausbildungsförderungsgesetz (BaföG). The maximum amount is currently EUR 670 per month given as a combination of grants and loans. The Generation Contract of HHL Leipzig Graduate School of Management and Brain Capital is a flexible model to finance your studies at HHL. This concept is a risk free and easy way of financing your time at HHL. While you focus on your studies, the HHL Bildungsfonds pays your tuition fees. After your graduation you have a high degree of freedom and flexibility. Students admitted into one of HHL’s programs may apply for the education fund offered by CareerConcept AG (up to EUR 30,000). After graduation the student has to pay back a fixed percentage (typically 4-10%) of his/her income over a period of 48-96 months. Unlike a loan, students do not have to pay back a fixed amount of interest and redemption. The concept considers personal income situation and individually calculates personal financing options. The payback does not begin until the student has secured a job. The Deutsche Bank offers student loans of up to EUR 800 per month (up to 60 months, max. EUR 30,000). Repayment starts 3 months (12 months at the latest) after graduation. Applicants with an above average Bachelor degree benefit from a reduced interest rate. By concentrating on proactive measures German ESF fund 2014-2020 is combating social exclusion and supporting the ‘upgrade’ of workforce in order to meet demographic challenges. At national level, it concentrates on the adaptability of workers to support and sustain the growing economy. The fund is available in several federal states in Germany (e.g. Saxony, Saxony Anhalt), but the prerequisites are different. The loan is offered for studies of up to 24 months in duration with the maximum amount of 200 000 MXN. The loan amount may be used for tuition, living expenses and medical insurance. For more information and to apply for the loan, please visit the official website. The KfW Bankengruppe offers student loans at reduced interest rates of up to EUR 300 per month (max. EUR 7,200). The payback begins 4 years after the payment started. Both the Ontario government and federal government provide this money. Through one OSAP application, you have access to a mix of different financial aid programs, depending on your circumstances. For more information and to apply, please visit the official website. Prodigy Finance is revolutionizing student finance. 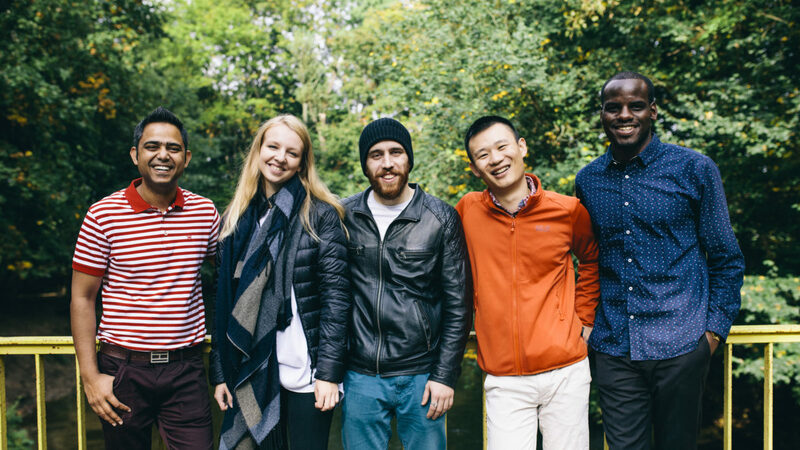 The innovative model offers alumni-funded loans to international students at the world’s top business schools, including HHL. While banks base their loan decisions on historical salaries, Prodigy looks to the future. The loan affordability is determined by the assessment of applicants’ future earning potential (based on the past achievements of similar graduates). The model is borderless, offering competitive rates to over 150 nationalities of students. Accepted students into the Master’s in Management and Full-time MBA are eligible to apply for a loan with Prodigy. HHL is the ONLY business school outside of China that is approved by Shanghai Pudong Development Bank (SPD Bank) with this student loan. SPD bank provides HHL master program students with flexible education loan with amount up to RMB500.000 (equivalent to EURO 72.000) with different payback schemes. For more information and to apply, please please contact SPD bank directly. Applicants from the U.S. (U.S. citizens) with eligibility to use educational assistance of the Department of Veterans Affairs. Please apply online or use the application form VA 22-1990. Applicants from the U.S. (U.S. citizens), Full-Time MSc, Part-time MBA (Leipzig), Full-time MBA, Part-time MBA (Leipzig), Doctoral program. borrow directly from the U.S. federal government and have a single contact – the Direct Loan Servicing Center – for everything related to the repayment of your loans, even if you receive Direct Loans at different schools. HHL’s Federal School Code is G38183 (you will need it to file your FAFSA – Free Application for Federal Student Aid). In Germany, 13 organizations offer scholarships for talented students. The target groups of the giving organizations differ with regard to their religious background or political and social mindset. Das Avicenna-Studienwerk ist das jüngste der staatlich anerkannten und geförderten Begabtenförderungswerke in Deutschland. Leistungsstarke und gesellschaftlich besonders engagierte muslimische Studierende und Doktoranden aller Fachrichtungen werden durch Stipendien materiell und ideell gefördert. Das Avicenna-Studienwerk fördert ausschließlich Studierende, die ihr Abitur in Deutschland abgelegt haben. Das Cusanuswerk stellt besonders begabten katholischen Studierenden aller Fachrichtungen und Hochschulen Stipendien während des Studiums und der Promotion zur Verfügung. Die Bischöfliche Studienförderung Cusanuswerk ist das Begabtenförderungswerk der katholischen Kirche in Deutschland. Mit staatlichen, kirchlichen und privaten Zuwendungen hat das Cusanuswerk bereits mehr als 9000 hochbegabte katholische Studierende und Promovierende gefördert – ideell und finanziell. Cusanerinnen und Cusaner tragen mit fachlicher Exzellenz und herausragendem Engagement zum Gemeinwohl bei, ein Leben lang und vielfach in besonders verantwortungsvollen Positionen von Kirche und Gesellschaft, von Wissenschaft, Politik und Wirtschaft. Das Cusanuswerk wurde von der European Foundation for Quality Management mit dem Zertifikat “EFQM Committed to Excellence – 2 star” ausgezeichnet. Im Rahmen der Förderung entstehen Orte der Begegnung, die dazu ermutigen, eigene Wege zu gehen und Verantwortung in Gesellschaft, Wissenschaft und Kirche zu übernehmen. Ein vielfältiges Bildungsprogramm lädt zur Diskussion über Wissenschaft und Glaube, Gesellschaft und Kirche ein. Vertrauensdozent ist Prof. Dr. Wilhelm Althammer. Das Ernst Ludwig Ehrlich Studienwerk (ELES) fördert besonders begabte jüdische Studierende und Promovierende. Diese Förderung setzt auf das Engagement und die Selbstentfaltungsmöglichkeiten unserer Stipendiaten und Stipendiatinnen. Durch Maßnahmen ideeller Förderung stärken wir jüdische Identität, Verantwortungsbewusstsein und Dialogfähigkeit. Sie sollen ermutigt werden, die Zukunft mitzugestalten. Die interdisziplinären ELES-Kollegs bieten den Stipendiatinnen und Stipendiaten die Möglichkeit, sich mit internationalen Studierenden und Promovierenden fächerübergreifend auszutauschen und Themen der Gegenwart im Umfeld der eigenen religiösen Tradition zu reflektieren. Gastvorträge und Exkursionen ergänzen das Programm. Besonderer Höhepunkt ist eine jährlich stattfindende Auslandsakademie in Israel. Das Evangelische Studienwerk Villigst ist das Begabtenförderungswerk der Evangelischen Kirchen in Deutschland und fördert derzeit rund 1000 Studierende aller Fachrichtungen sowie 250 Promovierende. Darunter sind auch 50 Europäerinnen und Europäer vor allem aus osteuropäischen EU-Staaten, die an Hochschulen und Fachhochschulen in Deutschland studieren. Die Heinrich-Böll-Stiftung ist die grüne politische Stiftung. Unter dem Motto «Rückenwind für Talente» fördert sie jährlich rund 1000 Studierende und Promovierende aller Fachrichtungen und Hochschultypen aus dem In- und Ausland, die den Zielen des grünen Projekts positiv gegenüber stehen. Wir sind dem Nachhaltigkeitsgedanken verpflichtet, setzen uns für Chancengerechtigkeit ein und verstehen unsere Studien- und Promotionsförderung als Beitrag zur Demokratieförderung. Vertrauensdozent ist Prof. Dr. Manfred Kirchgeorg. Die Rosa Luxemburg Stiftung ist eine politische Bildungseinrichtung und steht der Partei DIE LINKE nahe. Ihr Ziel ist es, durch politische Bildung zu Demokratie, sozialer Gerechtigkeit und Solidarität sowie zum Ausgleich sozialer, geschlechts- oder ethnisch bedingter Benachteiligung beizutragen. Diese Werte bilden die Grundlage der Studien- und Promotionsförderung des Studienwerks der Rosa Luxemburg Stiftung. Mittlerweile wurden über 1500 Stipendiat_innen aus dem In- und Ausland gefördert. Aktuell erhalten über 1000 Studierende und Promovierende ein Stipendium. Jährlich werden ca. 150 Stipendien vergeben. Das Studienförderwerk Klaus Murmann der Stiftung der Deutschen Wirtschaft (sdw) ist benannt nach seinem Stifter, dem Unternehmer und ehemaligen Arbeitgeberpräsidenten Klaus Murmann. ein vielseitiges, interdisziplinäres Förderangebot, das unter dem Leitmotiv „Unternehmerisches Denken und Handeln in gesellschaftlicher Verantwortung“ steht und ihrer Persönlichkeitsentwicklung dient. Markenzeichen unserer Förderung sind die persönliche Betreuung, das überfachliche Seminarprogramm, der intensive Austausch mit Unternehmern, Unternehmen und weiteren gesellschaftlichen Akteuren sowie die vielfältigen Mitgestaltungsmöglichkeiten für die Stipendiatinnen und Stipendiaten. Unser aktives Netzwerk aus Stipendiatinnen und Stipendiaten, Alumni und Führungskräften aus Wirtschaft und Bildung bildet eine Gemeinschaft weit über die Förderzeit hinaus. zur wissenschaftlichen Vertiefung, zum fächerübergreifenden Dialog und für internationale Erfahrungen. Die Geförderten bilden die gesamte Breite und Vielfalt weltanschaulicher, religiöser sowie demokratisch verankerter politischer Hintergründe und Werte ab, die sie in das Programmangebot der Studienstiftung einbringen. Vertrauensdozent ist Prof. Dr. Andreas Pinkwart.